Since the official refugee reception centre in the French town of Calais closed in 2002, undocumented migrants hoping to cross the Channel to Britain have found shelter in a number of squatted migrant camps, locally known as “the jungles”. Consisting largely of tents and self-built shacks, the two largest in Calais and Dunkirk now have some 8,000 residents between them. Many are refugees fleeing conflict in Syria, Afghanistan, Iraq and Sudan and surviving in extremely poor living conditions. For the most part, this is a humanitarian disaster. But the jungles of Northern France are also giving rise to a new political movement, which draws in new supporters every day. Because the French government has not officially recognised the makeshift shanty-towns as refugee camps, major aid organisations are absent. All aid is organised by small charitable groups and their volunteers. In the past few months, thousands of them have come from Britain and other neighbouring countries. Many are bringing donations of food and clothing, and they stay on to work in warehouses and in the camps. With every visit, new friendships are made between volunteers and refugees. The volunteers are often shocked by the conditions they find. A 2015 study found migrants living in the new, tolerated camp outside Calais were being exposed to significant risk of injury and ill health. According to the researchers who carried out the study, the situation amounts to a humanitarian crisis. This was their assessment after a trip to Calais in the summer, long before the cold and wet weather set in. Since then, conditions have deteriorated even further. The number of people living in the Calais camp has swelled to more than 6,000 and many don’t have access to the shoes and waterproof clothing needed to handle winter on a northern European coast. A large area of the camp has also now been bulldozed after the French government decided to set up a buffer zone between the camp and the motorway. Confrontations with riot police are frequent, especially at night, leaving migrants suffering from the effects of tear gas. Significant changes have also been made to the infrastructure, with government-sponsored containers intended to house 1,500 migrants. While these provide better insulation from the weather, they lack any kind of communal facilities and many migrants fear that the biometric security installed at the entrance to the enclosed compound will be used to control their movements. The situation in the Dunkirk area is even more perilous. Many residents there are Kurdish families from Iraq, some with small children. Much of the site is covered in thick mud and there are few sanitation or washing facilities. Among the incredible volunteering efforts, what has sometimes been lost are the political demands made by many of the migrants themselves. There have been almost daily acts of migrant-led protest, all captured by the activist group Calais Migrant Solidarity. They have marched, blockaded motorways, gone on hunger strike and held sit-ins outside Calais town hall. I observed one such protest organised by a group of Parisian “sans papiers” organisations. More than 2,000 people – many of them from Afghanistan, Iraq, Syria, Eritrea or Sudan – left the Calais camp to march into the town centre. All along the route their chants of “UK, UK” and “No Jungle, No” demonstrated the desire to escape the refugee camp to build a new life in Britain. Despite a sizeable police presence, several hundred protesters were able to breach the secure port area and reach a P&O ferry, which was briefly boarded by up to 50 refugees. The migrants are essentially calling for human rights to trump citizenship rights. Volunteers are of course helping but the migrants are also wary of efforts to improve conditions in the jungle. This is a place they hope to be able to leave behind soon. The response to the appeals to deliver aid to Calais has been so overwhelming that the frequent deliveries have sometimes caused chaos on the ground. For some it shows clearly that a solution needs to be found that goes beyond charity and philanthropy. In the Calais jungle, this was clear to see. 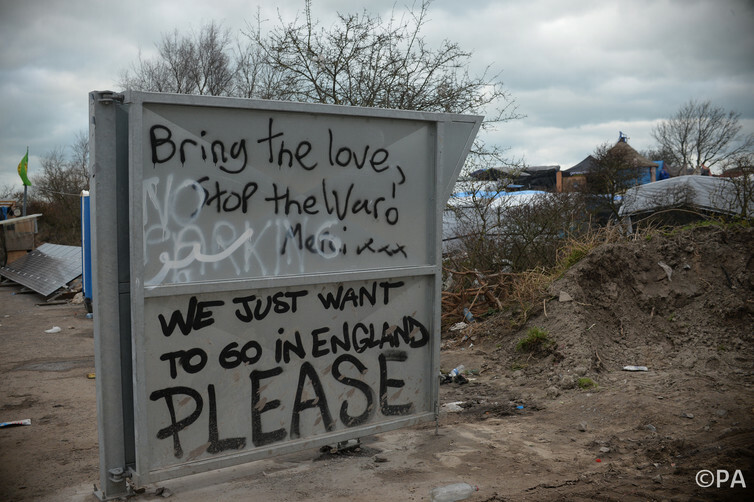 Graffiti on tents and walls spoke not just of the dream to live in Britain, but also of human rights, dignity, peace and an end to police violence. These aims can’t be realised by volunteers and aid workers alone. But equally, if people on both sides of the Channel are being mobilised by their encounters and experiences, it could have a profound effect on pro-refugee and “no border” activism in France, Britain and beyond. The Calais migrants only make up a tiny percentage of refugees in Europe. If more are to arrive, calls for a political response will become louder – both from the right and from the left. The volunteers in Calais are a reminder that there is grassroots opposition to the moves towards increased border control across Europe. Tagged Afghanistan, aid, Calais, Calais Migrant Solidarity, Iraq, migrants, Raphael Schlembach, refugee camps, Sudan, Syria, The Conversation. Bookmark the permalink.